There is a clear and present danger that the US agents would try to initiate street violence during today’s manifestations in Skopje under false flag, as it was the case with snipers in Kiev. In the interview with the major Macedonian news agency Netpress Andrew Korybko argues that besides economic and political, there are ideological reasons for the aggression of the West against Macedonia, aimed to destroy conservative traditional values in the local society using SDSM [opposition Social-democratic Union of Macedonia) and a number of NGOs on the Soros payroll as a tool of destabilization. The latest announcement of the Russian Ministry of Foreign Affairs after the terrorist attack in Macedonia is saying that the opposition and the NGOs in the country, inspired by the West, are trying to make a so-called color revolution. So now it is more than clear that all this that has been happening these last months, the failed coup, the publishing of the illegally wiretapped phone records, the protests, and the terrorist attack is a strategy created and supported by the opposition, the Soros NGO`s, and some western powers in order for Macedonia to withdraw from Turkish Stream Russian pipeline. What are the details from the dark scenario that they had in mind? The main strategy is to overthrow the government using a Color Revolution, but if that doesn’t work, then they plan on introducing an Unconventional War modeled off of the Syrian template. We already see the beginning of the second strategy with the terrorist attack in Kumanovo, which they staged in order to try to instigate the Albanians to break away from the democratically elected and legitimate government. They hope to stain the Albanians’ reputation by affiliating them with this terrorism in order to incite ethnic and religious tensions on both sides. If the combination of Color Revolution and Unconventional War doesn’t succeed in overthrowing the government, then they hope that the resultant chaos can create a pretext for a formal military intervention by NATO. This could see Albania occupy the ethnic Albanian areas of Western Macedonia under a false ‘humanitarian intervention’/’responsibility to protect’/’anti-terrorism’ guise or a more unified NATO intervention between both Albania and Bulgaria, the latter of which have sent troops to the border ostensibly to deal with ‘refugees’. The end game of this entire destabilization is to remove Macedonia’s patriotic and internationally recognized government, change the constitutional name of the country, possibly federalize or partition the state (maybe even between both Albania and Bulgaria, with the EU/NATO supporting Sofia’s occupation as a ‘reward’ for rejecting South Stream), and ultimately sabotage Russia’s Balkan Stream pipeline plans. But obviously, something in Macedonia is not working out for them. Besides the timely and decisive moves from the top state officials, it seems that they are also failing mostly thanks to the wisdom of the citizens, both Macedonian and Albanian, who realized what kind of scenario is going on, who the directors are, who is telling the truth, and who is telling lies. Yet, it is naive to think they will give up like that and open the way for the Turkish stream. What can we expect next? Macedonia can certainly expect more violent provocations since the US will not give up its plans that easily. I commend all Macedonians for their calm and peaceful reaction to the existing provocations, and especially extend my respect to the Albanian population for thus far avoiding the externally directed temptation of Greater Albania. But, I do see the West increasing their pressure on all Macedonians, especially ethnic Albanians, in order to try to split society. We already see international (Western) diplomatic interventions through the biased statements by the EU, NATO, and the joint statement of the US, EU, France, UK, and Italy, essentially laying equal blame to the security forces for the terrorist attack! The method behind their madness is to create a pretext for sanctions against the people of Macedonia that are designed to decrease their living standards and economic growth (which was stronger than the Eurozone’s last year) so that they feel pressured to join the Color Revolutionaries or ethnic terrorists. However, I’m very worried that the US will initiate false-flag violence in Skopje like they did with the snipers in Kiev in order to accelerate the country’s destabilization. Everything comes down to 17 May and the forthcoming Color Revolution/coup attempt. I feel that this day is setting itself up to go down in Macedonian history either as the day the destabilizers were defeated or the day Macedonia was thrown into full chaos. There is just too much Western media coverage on the upcoming event right now for Washington to not throw all of its resources into making it a regime change ‘success’, although I predict that the majority of Macedonians will continue to resist the external war being waged on their country with the same devotion and heroism as their Syrian counterparts. The situation in Macedonia is obviously raising the red alarm in Greece also, since the both are going to be transit countries for the gas, together with Serbia. We know that in the past during the negotiations for the South stream project, the Greek prime minster Kostas Karamanlis was facing an assassination because Greece agreed to take part in the project while in the same time all the phone conversations of the top state officials were wiretapped. This whole strategy was being conducted by a spy network from few allied secret services and least 20 Greeks, and many believe that this network was behind the violent riots and clashes during the mandate of Karamanlis. Should the Greek government expect some similar pressure now or this time they are planning to go after all the transit countries by using the ISIL fighters and the story of Great Albania? I think it’s certainly possible and I wouldn’t discount that scenario, but I feel that it’s more likely that the US will first try to use internal pressure against Syriza before it resorts to external means like in Macedonia. They want to split the party’s base and lead to its dismissal in early elections, hoping that this could be a more cost-effective and easier way to sabotage Balkan Stream in Greece. Other means they may employ could be offering Greece generous financial deals in exchange for reneging or delaying Balkan Stream, as well as paying some of the German World War II reparations that are currently being discussed. Such payments would only be a form of bribery to Syriza in this case, as Germany has no motivation to provide any money to Greece without political strings attached. Finally, the US diplomatic push in Greek affairs and sphere of influence is obviously purposed as some type ‘grand deal’ that Washington wants to make with Athens. This explains why John Kerry and Amos Holstein are lobbying for the TAP [Trans-Adriatic] pipeline over Balkan Stream, even though it’s in Greece’s best interests to have both pipelines transiting its territory. It’s also telling that Russia doesn’t object to this at all, and that it’s the US that wants to force Greece to make a choice. In order to ‘sweeten the deal’, Washington is now proposing a federalization model for Cyprus in order to resolve the long-standing conflict there. It would be foolish for one to think that these two diplomatic pushes aren’t connected, since it’s obvious that the US hopes to lobby Greece against Balkan Stream by all of a sudden pretending that it’s pursuing its interests in Cyprus. Let’s talk about the foreign media propaganda. It is almost funny to see how some of the pro- western media have absolute bias in their reports, pointing fingers, publishing statements or interviews only from the opposition and Soros activists and making cheap and pathetic spins. Is it coincidence that most of this media seem to be coming from the US, Germany and Britain, and a few from the region that are financed by Soros? No, it’s not a coincidence because these are the same political forces fighting against Macedonia. I’d like to emphasize the hostile political nature of these entities because their economic interests are naturally aligned to Balkan Stream, as is the case with Germany and the entire EU as a whole, for example. However, the US-controlled political forces oppose Balkan Stream due to Washington’s pressure in the New Cold War, and if they want to retain power and not be ousted via their own manipulated ‘wiretapping scandal’, political putsch, or Color Revolution, then they must abide by whatever the US says. And one more thing – these Western actors are supports of hyper liberalism and have tried to destroy the same religious-conservative values in their own country that Prime Minister Gruevski and VMRO are trying to reinforce and promote in Macedonia, so they also have ideological reasons for their information aggression as well. Zaev is cut from the same cloth as these Western politicians and aims to enforce a hyper liberal model on Macedonia that would do away with all of the values-based successes of the past decade. More or less, all the transit countries are and will be facing pressure on many ways and levels, but why it seems that so far Macedonia is facing the hardest pressure? Was one of the reasons maybe because they couldn`t find better allies as the ones they find in Macedonia? Do you think that the leader of the biggest Serbian or Greek opposition party would accept to go with this dark scenario, the way SDSM and Zoran Zaev did? I think that Color Revolutions and their evolving political tactics are always possible and remain a threat to every country that resists the unipolar world, but Macedonia was targeted specifically because its demographics make it an ideal ‘laboratory’ setting. Allow me to explain. There are only a little more than 2 million people in the country, thereby making it relatively easier for foreign intelligence services to spy on a larger percentage of the population than in larger states. This also means that the country has a smaller media market which can easily be penetrated by Color Revolutionary influence and external information pressure. Additionally, there’s around a 25% Albanian minority according to some statistics and they live mostly along the Albanian-“Kosovo” border, thereby making them exceptionally vulnerable to the temptation of Greater Albania. Finally, the ‘opposition’ was already boycotting the Parliament as it was, thereby creating the perfect social situation for a Color Revolution to took root and be ‘convincingly’ broadcast to outside audiences. All of these factors came together to create a situation that the West couldn’t’ resist destabilizing, if only for the fact that its demographics provide it with easily controllable variables to that make for a perfect Color Revolution test scenario. The destabilizing lessons being refined in Macedonia are designed for export elsewhere afterwards (perhaps to Serbia once more), but at the same time, the resistance of the Macedonian people (inspired by their Syrian counterparts) can serve as an exported example as well to help counter these mechanisms in future theaters. We are witnessing major shifts on the global power map. It seems that more and more countries are turning towards Russia, or to be more concrete, more and more leaders are facing lots of pressure from Brussels and Washington simply because they are nurturing good and friendly relations with Putin and are also willing to corporate in different ways. At the same time, we see that the crisis in Macedonia was developing really fast and the creators are pushing it real aggressively, so is this aggressiveness the result of them losing global power and being unveiled on the global scene, and are you optimistic that the Balkan Stream will soon be pumping Russian gas? I think that the harsh reaction is definitely due to the fear that Russian influence in the Balkans can serve as the backdoor to soft influence over the rest of Europe. 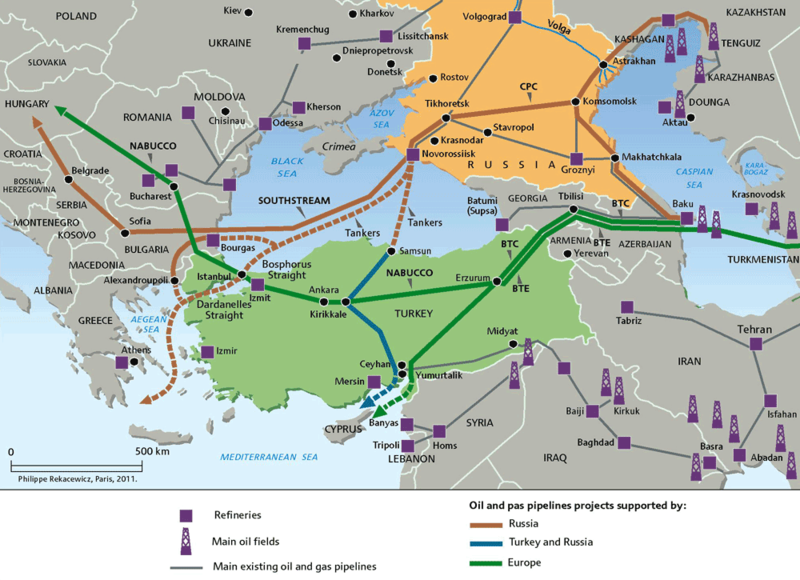 In reality, however, the completion of Balkan Stream would at the very least be a continuation of the existing state of affairs where Russia provides around 30% of the EU’s energy needs. Balkan Stream is basically a replacement for South Stream, which for its own part would have been a replacement for the Ukrainian-bypassing pipelines that will be phased out by 2019. The discomfiting fact that EU policy makers try to forget is that they can’t survive without Russian gas – it’s impossible. The EU and Russia are natural partners by virtue of their geography and history, and the completion of Balkan Stream will reinvigorate their positive bilateral relations. The conflict, however, is that the US absolutely does not want this to happen since it understands that it would lessen its control over Europe, and consequently Eurasia. One needs only to reference former National Security Advisor and noted Polish-American geostrategic Zbigniew Brzezinski’s ‘The Grand Chessboard’ to see this explicitly stated. Therefore, the US wants to use its proxy EU elites to enforce pressure on whichever leader or country wants to build pragmatic relations with Russia, hence the current externally driven destabilization in Macedonia. The future of the Balkans runs through Macedonia, and the country is now the latest flashpoint of the New Cold War. Be that as it may, I have full faith in Macedonians that they will bravely resist this aggression and fight for their sovereignty and security, and I don’t expect them to capitulate like the divided Ukrainians did so early in the game. Instead, I see them embodying the spirit of Syrians in pushing back against this external offensive and protecting their cherished country. All in all, it might take a bit more time than initially expected, but I do predict that Balkan Stream will eventually be created and that Russian gas will continue being pumped through the region.